It is now well established that people with Down syndrome typically experience specific delays and deficits in language relative to other cognitive domains, with many adults showing persistent problems in the areas of morphology and syntax (Fowler, 1990; Miller, 1992; Rondal & Comblain, 1996; Tager-Flusberg, 1999). There is, however, much variability between individuals, with some developing to a much higher level of linguistic competence (Rondal, 1995). The profile of abilities can also change over time in the same individual. Miller (1999) found evidence for several distinct cognitive profiles in children with Down syndrome. The most common pattern was one in which receptive language and nonverbal mental age were in advance of expressive language, but there were smaller groups who showed different patterns, including a substantial group whose expressive language was at the same level as their receptive language and nonverbal ability, and others who showed delays in both receptive and expressive language. The same individuals could show different profiles when tested at different times over a two-year period. Recent work by Paterson (2000; see also Paterson, Brown, Gsödl, Johnson & Karmiloff-Smith, 1999) also indicates that cognitive profiles in both Down syndrome and Williams syndrome change over time, emphasising the importance of developmental processes and the problems that can be encountered when applying an adult neuropsychological model to genetic disorders. One major influence on early language development, and particularly lexical development, in typically developing children is the relationship between the language addressed to the child and the focus of joint attention between child and adult. Working within a theoretical approach derived from Bruner (1975, 1983) a series of studies during the 1980s established that mothers interacting with their children are responsive to the child's focus of attention (e.g. M. Harris, Jones and Grant, 1983, 1984/85). Subsequent research showed that the rate of vocabulary development was influenced by the opportunities afforded to children to relate language input to objects and activities on which their attention was focused (M. Harris, Jones, Brookes and Grant, 1986). Tomasello and Farrar (1986) showed that there was a positive correlation between maternal references to toys that were at the focus of the child's attention and vocabulary size at 21 months. Object references that tried to redirect children's attention were negatively related to vocabulary. The importance of reference to jointly attended objects and activities is reinforced by the finding that children's initial use of words is related to the most frequent use in the input (M. Harris, Barrett, Jones & Brookes, 1988; Hart 1991). Despite the relative lack of research on joint attention and early language in atypical groups (Conti-Ramsden, 1994, identifies this as an under-researched area), there has been some research with deaf children (e.g. M. Harris, Clibbens, Chasin and Tibbitts, 1989) and with children with Down syndrome. The research with deaf children learning sign language will be briefly discussed in a later section of this paper. Working with children with Down syndrome, S. Harris, Kasari and Sigman (1996) found that there was a significant positive association between measures of joint attention between children and caregivers and receptive language gain in the children. They also found a significant positive association between receptive language and the frequency with which caregivers maintained attention to toys which had been selected by the child, and a significant negative association between receptive language and the frequency with which caregivers redirected children's attention away from toys: especially those which had been selected by the child. These findings parallel those of Tomasello and Farrar (1986) for typically developing children. S. Harris et al. (1996) argue that attending to the child's focus of attention, rather than redirecting attention, minimises the attentional load for the child and that this may be particularly important for children with Down syndrome in view of their reduced attentional capacity (Landry & Chapieski, 1990). Despite their attentional and auditory perceptual impairments, children with Down syndrome have relative strengths in visuo-spatial and visuo-motor skills (Jarrold & Baddeley, 1997; Tager-Flusberg, 1999). This, combined with the fact that these children frequently show a preference for gestural over vocal communication (Caselli, Vicari, Longobardi, Lami, Pizzoli & Stella, 1998; Tager-Flusberg, 1999) has led to the development of interventions which make use of all available sensory modalities, with an increasing use of signing, in conjunction with spoken language, from the 1970s on. Sign systems were initially introduced with adults, but their use was rapidly extended to children (Kiernan, Reid & Jones, 1982; Walker, 1978). Support for the use of sign systems with children with Down syndrome came initially from small group and case-studies, and, more recently, from some larger-scale studies incorporating experimental controls. Le Prevost (1983) presented an early case study indicating the potential benefits of signing with babies with Down syndrome in the pre-speech period. Kouri (1989) argued that children who have failed to develop spoken language will often learn extensive sign vocabularies, and presented a case-study of a young child who, during an eight month period of sign and speech intervention, developed a vocabulary of 1,643 signed and/or spoken words. Iacono, Mirenda and Beukelman (1993) and Iacono and Duncum (1995) presented evidence of the benefits of signs alone and in combination with other augmentative and alternative communication systems. Remington and Clarke (1996) argued that, in addition to providing a (possibly temporary) substitute for speech in young children, signing can help reduce frustration and challenging behaviour. They suggest that this may facilitate improved interaction patterns which, in turn, assist speech development. Several studies, including Kouri (1989) and Remington and Clarke (1996), emphasise the benefits of signing for speech development and intelligibility, with a common assumption that the use of signs can be phased out, or will be abandoned by children, as speech improves (Abrahamson, Cavallo & McCluer, 1985; Weller & Mahoney, 1983). Woll and Grove (1996) present an interesting study of twins with Down syndrome born to deaf, signing parents. The children developed knowledge of both British Sign Language and spoken English, but showed evidence of a dissociation between lexical and morphosyntactic ability in both modalities. This indicates that, despite its early benefits, signing is not a panacea for children with Down syndrome, and that the particular difficulties in the areas of morphology and syntax noted above may have a deeper basis. Larger scale studies of early signing in children with Down syndrome have been carried out by Miller (1992) and Launonen (1996). Miller looked at 44 children with Down syndrome and 46 typically developing children, with mental ages of 11 to 27 months. From 11 to 17 months (mental age) the total vocabularies of the children with Down syndrome (spoken and signed) were greater than those of the typically developing group (spoken only). At 17 months mental age, the vocabularies of the children with Down syndrome contained twice as many signed as spoken words. By 26 months there was a big acceleration in the spoken vocabularies of the children with Down syndrome, and the number of signed words declined. Miller suggests that children with Down syndrome show an early advantage for signing (in line with the preference for gestural communication noted above) and that signs can significantly increase their communicative ability during an important developmental period. Launonen (1996) studied the effects of keyword signing in children with Down syndrome in Helsinki, Finland. Twelve children with Down syndrome received an intervention package, including manual signs, gesture and action, from six months to three years of age. The intervention programme emphasised the active communicative role of the child. A non-intervention group, containing a further twelve children with Down syndrome, served as a control. The average vocabulary (signed and spoken) of the intervention group at age 3 (chronological age) was as large as that of the control group at age 4. The children were followed up from 3 to 5 years of age and were found to be in advance of the control group in the areas of language, social behaviour, self-help, cognitive and motor development throughout this period (using the Portage assessment) (Tiilikka & Hautamäki, 1986). The speech of the signing group was also enhanced compared with that of the control group. In a further follow-up at 8 years of age (five years post-intervention) Launonen (1998) found that there was still a significant difference in social and linguistic skills between the two groups. The intervention group were ahead in language comprehension, interaction, reading and writing. Eight children in the intervention group and five in the control group used speech as their primary means of communication, two children in the intervention group used mainly manual signs and one child in each group combined signs and speech. Five children in the control group (compared with one in the intervention group) had no functional expressive communication - these five also showing very poor interaction skills. The results suggest that early interaction with manual signs, combined with an emphasis on the active communication role of the infant (c.f. S. Harris, Kasari & Sigman, 1996), may have long-term benefits for the development of children with Down syndrome. Both Miller and Launonen emphasise the general benefits for communication and other aspects of development afforded by the use of signs. Both also, in line with other studies cited above, argue that signs can be used as a temporary expedient for many children, which can be phased out as the children master speech. It is worth noting, however that a minority of the children in Launonen's study were dependent on signing for a longer period. 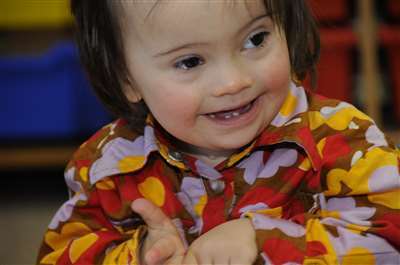 There are also studies indicating that signing may have continuing benefits for adults with Down syndrome. Powell and Clibbens (1994) studied four adults with Down syndrome (all male). Raters were asked to listen to their speech in conditions where they were simultaneously signing and where they were not. Speech accompanied by key-word signing was always rated as more intelligible than speech alone, whether the raters could see the speaker/signer or were only listening to an audio-recording. This finding is of interest in view of one of the arguments often advanced against the use of signing - that communication partners will be restricted to those who know the system. If signing leads to more intelligible speech it may benefit communication even if the interlocutor does not know any signs. Given the evidence presented above that signing offers benefits to both children and adults with Down syndrome, consideration needs to be given to the most appropriate intervention/teaching methods to maximise that benefit (Clibbens, 1993). This will clearly vary depending on the age of the individuals involved, among other factors. As an example we will consider the potential application of findings from studies of joint attention and early sign language development in deaf children from deaf, signing, families. Harris, Clibbens, Chasin and Tibbitts (1989) looked at strategies used by deaf mothers to enable children to perceive both signs addressed to them and the toys or other objects and activities to which those signs related. In line with studies of joint attention and early language discussed above, they found that strategies which enabled children to perceive the signs while not disrupting their attention were more effective than those which attempted to manipulate the child's attention. These effective strategies included, where necessary, displacing signs into the child's visual field or, in the case of signs involving contact with the signer's body or face, displacing these actually onto the child. The use of these non-disruptive strategies, by enabling the child to establish the link between a sign and its referent, appeared to help children to "tune in" to the visual-gestural channel through which the signs are transmitted, facilitated the development of attentional switching between signed input and the activity in which the child was engaged, and was associated with faster lexical development. Clibbens, Powell and Atkinson (in press) carried out an analysis of signs addressed to children with Down syndrome, using the categorisation system discussed briefly above. When signs were addressed to the children they were able to perceive both sign and referent much of the time. Nevertheless the range of strategies used by mothers of children with Down syndrome was limited, and there was clearly much scope for adopting successful strategies used by deaf mothers in order to increase the number of signs perceived by children. This applies particularly to signs involving contact with the signer's face, which are very difficult to present in such a way that the child can perceive them without disrupting the activity in which the child is engaged: as noted above, these can be displaced onto the child's face initially. Once the children have tuned in, and developed the ability to switch attention, the signer can revert to signing in the typical location. Anecdotal evidence from individual interventions by speech and language therapists suggests that the adoption of these strategies is likely to be effective with children with Down syndrome, but a larger-scale, controlled, follow-up study is now required. Signs can be, and frequently are, used in combination with graphic symbols. Symbols themselves are normally combined with the use of printed words, so there is no need for use of one system necessarily to rule out the use of another. One issue that does require more research, however, is that of how joint attention may be promoted with children using symbols and other alternative communication systems. There is also a need for more basic research on the use of different forms of language and communication system in relation to the perceptual, attentional and cognitive abilities of people with Down syndrome. Abrahamsen, A., Cavallo, M., & McCluer, A. (1985). Is the sign advantage a robust phenomenon? From gesture to language in two modalities. Merrill-Palmer Quarterly, 31, 177-209. Bruner, J.S. (1975). The ontogenesis of speech acts. Journal of Child Language, 2, 1-19. Bruner, J.S. (1983). Child's Talk . Cambridge: Cambridge University Press. Caselli, M.C., Vicari, S., Longobardi, E., Lami, L., Pizzoli, C. & Stella, G. (1998). Gestures and words in early development of children with Down syndrome. Journal of Speech, Language and Hearing Research, 41, 1125-1135. Conti-Ramsden, G. (1994). Language interaction with atypical language learners. In C. Gallaway & B. Richards (Eds. ), Input and Interaction in Language Acquisition. Cambridge: Cambridge University Press. Clibbens, J., Powell, G.G. & Atkinson, E. (in press). Strategies for achieving joint attention when signing to children with Down syndrome. International Journal of Language and Communication. Clibbens, J., Powell, G.G. & Grove, N. (1997). Manual signing and AAC: Issues for research and practice. Communication Matters, 11 (2), 17-18. Fowler, A.E. (1990). Language abilities in children with Down syndrome: Evidence for a specific syntactic delay. In D. Cicchetti & M. Beeghly (Eds. ), Children with Down Syndrome: A Developmental Perspective. Cambridge: Cambridge University Press. Harris, M., Barrett, M., Jones, D. & Brookes, S. (1988). Linguistic input and early word meaning. Journal of Child Language, 15, 77-94. Harris, M., Clibbens, J., Chasin, J. & Tibbitts, R. (1989). The social context of early sign language development. First Language, 9, 81-97. Harris, M., Jones, D. & Grant, J. (1983). The nonverbal context of mothers' speech to children. First Language, 4, 21-30. Harris, M., Jones, D. & Grant, J. (1984/85). The social-interactional context of maternal speech to children: An explanation for the event-bound nature of early word use? First Language, 5, 89-100. Harris, M., Jones, D., Brookes, S. & Grant, J. (1986). Relations between the non-verbal context of maternal speech and rate of language development. British Journal of Developmental Psychology, 4, 261-268. Harris, S., Kasari, C. & Sigman, M.D. (1996). Joint attention and language gains in children with Down syndrome. American Journal on Mental Retardation, 100, 608-619. Hart, B. (1991). Input frequency and children's first words. First Language, 11, 289-300. Iacono, T.A. & Duncum, J.E. (1995). Comparison of sign alone and in combination with an electronic communication device in early language intervention: case study. Augmentative and Alternative Communication, 11, 249-259. Iacono, T.A., Mirenda, P. & Beukelman, D. (1993). Comparison of unimodal and multimodal AAC techniques for children with intellectual disabilities. Augmentative and Alternative Communication, 9, 83-94. Jarrold, C. & Baddeley, A.D. (1997). Short-term memory for verbal and visuospatial information in Down's syndrome. Cognitive Neuropsychiatry, 2, 101-122. Kiernan, C., Reid, B. & Jones, L. (1982). Signs and Symbols: Use of Non-vocal Communication Systems. London: Heinemann. Kouri, T. (1989). How manual sign acquisition relates to the development of spoken language: A case study. Language, Speech and Hearing Services in Schools, 20, 50-62. Landry, S.J. and Chapieski, M.L. (1990). Joint attention at six months in Down syndrome and preterm infants: Patterns of attention to toys and to mother. American Journal on Mental Retardation, 94, 488-498. Launonen, K. (1996). Enhancing communication skills of children with Down syndrome: Early use of manual signs. In S. von Tetzchner & M.H. Jensen (Eds. ), Augmentative and Alternative Communication: European Perspectives. London: Whurr. Launonen, K. (1998). Early manual sign intervention: Eight-year follow-up of children with Down syndrome. In Proceedings of the ISAAC '98 Conference. Dublin: ISAAC/Ashfield Publications. Le Prevost, P.A. (1983). Using the Makaton Vocabulary in early language training with a Down's baby: A single case study. Mental Handicap, 11, 28-29. Miller, J.F. (1992). Development of speech and language in children with Down syndrome. In I.T. Lott & E.E. McCoy (Eds. ), Down Syndrome: Advances in Medical Care. Chichester: Wiley. Miller, J.F. (1999). Profiles of language development in children with Down syndrome. In J.F. Miller, M. Leddy & L.A. Leavitt (Eds. ), Improving the Communication of People with Down Syndrome. Baltimore: Paul H. Brookes. Paterson, S.J. (2000). Language and number in Williams syndrome and Down's syndrome: From infant precursors to the mature phenotype. Unpublished PhD thesis, University College London. Paterson, S.J., Brown, J.H., Gsödl, M.K., Johnson, M.H. & Karmiloff-Smith, A. (1999). Cognitive modularity and genetic disorders. Science, 286, 2355-2358. Remington, B. & Clarke, S. (1996). Alternative and augmentative systems of communication for children with Down's syndrome. In J. Rondal, J. Perera & L. Nadel (Eds.). Down Syndrome: Psychological, Psychobiological and Socio-Educational Perspectives. London: Whurr. Rondal, J.A. (1995). Exceptional Language Development in Down Syndrome: Implications for the Cognition-Language Relationship. Cambridge: Cambridge University Press. Tager-Flusberg, H. (1999). Language development in atypical children. In M. Barrett (Ed. ), The Development of Language. Hove: Psychology Press. Tiilikka, P. & Hautamäki, J. (1986). Portaat-varhaiskasvatusohjelma. Helsinki: The National Welfare Association for the Mentally Retarded. Tomasello, M. & Farrar, M.J. (1986). Joint attention and early language. Child Development, 57, 1454-1463.
von Tetzchner, S. & Martinsen, H. (1992). Sign Teaching and the Use of Communication Aids. London: Whurr. Walker, M. (1978). The Makaton Vocabulary. In T. Tebbs (Ed. ), Ways and Means. Basingstoke: Globe Education. Weller, E.U. & Mahoney, G. (1983). A comparison of oral and total communication modalities on the language training of young mentally handicapped children. Education and Training of the Mentally Retarded, 18, 103-110. Woll, B. & Grove, N. (1996). On language deficits and modality in children with Down syndrome: A case study. Journal of Deaf Studies and Deaf Education, 1, 271-278.